A sweet marriage of convenience romance based in the town of Wyoming. I really enjoyed this book because a fan of books based on marriages of convenience and I really liked that these characters had a history together. 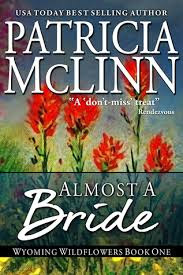 This was my first time reading a book by Patricia McLinn and I enjoyed her writing style because she put a lot of focus on her characters and their growth as people as well as the dual point of view allowed us to understand both the characters better. I loved Daves's character and his possessive alpha male ways especially the fact that he was sweet and willing to do anything to protect Matty from trouble. Matty's character was sometimes annoying because she was too impulsive and never considered anyone's feelings when she wanted to get to her goal. She was always picking on Dave for always knowing what his dreams and ambitions were which I felt was totally wrong, but I did like that she was strong and independent and able to stand up for herself when she was unhappy. The chemistry between Dave and Matty was hot and I especially liked the scenes where they would get caught. Overall this was a short, sweet and light read and I would definitely want to read the rest of the series. Matty Brennan always loved Dave Currick and always pictured marrying him, until he had broken her heart six years ago. Now after so many years Matty has returned to Wyoming and in order to save her families ranch she has to ask Dave to marry her. Dave knows that Matty is up to something, but when she comes to him for help, Dave like always is unable to refuse her. Dave has always done what is best for Matty, even if that means marrying her just for namesake. After one scorching hot kiss, Dave hopes that Matty will become more to him than Almost a Bride.